Anthony Corrado sniffs out the funding that is pouring into American politics these days from two emerging forces: super PACs and nonprofits. 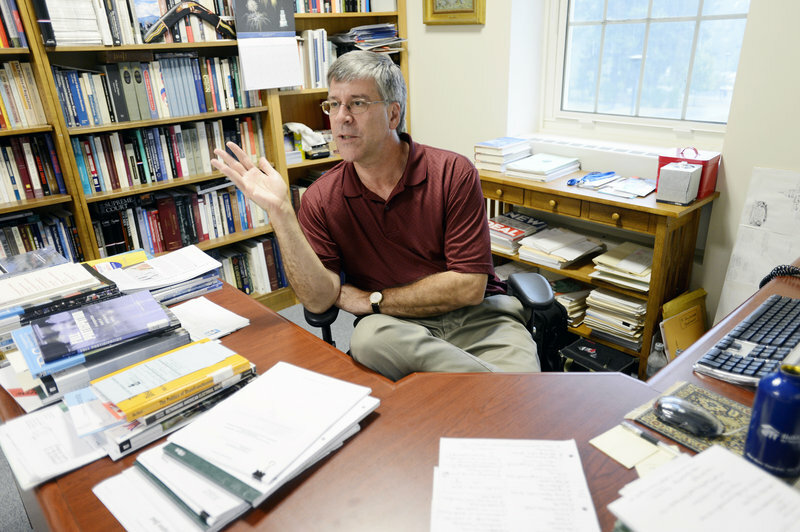 WATERVILLE – Most summers, you wouldn’t find Colby College professor Anthony Corrado in his office staring at the computer. But this isn’t most summers. Corrado is a nationally known expert on money in politics. He is a senior fellow at the Brookings Institution and chairman of the board of trustees of the Campaign Finance Institute. He also formerly had a career managing money for political campaigns, including Democratic presidential candidates. He usually travels, speaks and teaches in other parts of the country during the summer. But Corrado and a graduate student with a knack for following digital paper trails are busy tracking a tsunami of money in American politics. Not only is there more cash than ever before, it’s increasingly difficult to follow the money as fundraising tactics shift in response to new disclosure rules. Corrado is focusing his research on two emerging forces in politics: super PACs and nonprofit groups. Recent Supreme Court decisions, including Citizens United v. The Federal Elections Commission, have opened the door to unlimited political spending by such outside groups. While political donations to individual candidates and their election committees are limited and must be publicly disclosed, there is far less transparency surrounding the independent outside groups that are spending millions of dollars to influence races that could decide the balance of power in Congress. Maine saw its first significant spending by such an outside group in late July, when the U.S. Chamber of Commerce paid $400,000 to air television ads criticizing independent U.S. Senate candidate Angus King. Corrado, who predicted Maine would see such an advertising campaign, said there is a lot more money where that came from. The Portland Press Herald/Maine Sunday Telegram sat down with him in his office recently to talk about his efforts to follow the political money trail. Q:What are you doing at the college in the middle of summer? A: It’s a busy year with the election. We’re looking at the financing of the 2012 presidential race and how it’s changing from years past because of these outside groups. We’ve been for the last month focused on the super PACs, particularly the candidate-specific super PACs that have been supporting the presidential contenders, and looking at where they get their money. And then the second project is looking at disclosure, and the issues facing the political system now with respect to transparency of campaign funds … (and) how money is moving more and more into dark corners and secret funds that aren’t disclosed. Q: How difficult is it to follow the money with super PACs? A: It’s easier to follow the money with super PACs than with the nonprofit organizations because at least with the super PACs, they disclose their donors and their expenditures in regular reports. One of the problems, however, is that some of the super PACs report them monthly and others report them quarterly. There’s often a long wait. It’s often the case that super PACs receive contributions from other (groups) so it’s difficult to hunt down the original source of the funding. We are trying to follow the money back to the sources, which is hard sometimes. Part of the research in terms of the super PACs is looking for what kind of patterns or tactics you can find. … The other aspect we’re looking at, which is more anecdotal, is what are the relationships that develop between these candidates and these (candidate-specific) PACs? Q: Isn’t there supposed to be no coordination with campaigns? A: For the most part, the super PAC is supposed to be independent of the candidate. But if you look, the candidate can appear at the fundraisers, the staffs of the super PACs are longtime staffers or supporters or fundraisers for that candidate, the major (super PAC) donors sometimes travel with the candidate, and for the most part they are following strategies that parallel the presidential campaign strategy. So really, for all intents and purposes, there’s no independence at all. It’s really just another pot of money. A: While there’s been so much talk about super PACs, it’s a very new phenomenon. You really didn’t get the court rulings that sanctioned super PACs until basically summer of 2010. (They) were really something that emerged in August, September and October and then we had the election. And yet in those three months they managed to raise and spend $65 million in congressional races. So now we’re in a cycle where we’ve got some super PACs that (started fundraising) 20 months before the election. There are hundreds of new super PACs that have formed. Q: Will Maine see a lot of super PAC advertising? A: I wouldn’t be surprised if we saw a lot of outside money coming in before the race is over. I think particularly if the 2nd District congressional race continues to look like it’s going to be competitive. I think it’s a big fact that Kevin Raye has been put on the (Republican’s) “Young Guns” list because if you look at that list, that’s generally a list that party officials in Washington construct to (guide donations and spending). And that program has been very successful in getting money into these races. Q: And in the Senate race? A: If we see prospects that the Senate race is going to be more competitive than it looks now … What we’ve seen in some of these races is that outside groups come in and do some advertising early to see if that starts changing the numbers in the race, and if so that attracts more money. Q: You mentioned the nonprofits earlier. How do the nonprofits work compared to super PACs? A: Where the bigger problem is right now is with the nonprofit organizations and the trade associations. … Basically, the nonprofits are not required to report their political expenditures and contributions to the Federal Elections Commission. Often what you have now are groups that create a super PAC and a nonprofit (and the nonprofit arm can raise money and spend it or give it to the PAC). And so you don’t know who the donors are. And it’s the same thing with the other major groups in the nonprofit realm, which are trade associations such as the (U.S.) Chamber of Commerce and the pharmaceutical manufacturers association. The Chamber of Commerce is very aggressively contesting elections right now, but they don’t report any of their donors. … What they like to do is find races, especially House and Senate races, that they think are going to be key races. It’s generally assumed that one of the reasons why you don’t see lots of big corporations giving to, say, candidate-specific super PACs is because that’s all going to be disclosed and reported. It’s much easier to give to the Chamber of Commerce where it won’t to be disclosed. It’s a realm of activity that has been growing in the last few elections, and is really growing now. Q: How does the situation now compare to the situation in the Watergate era? A: We have some improvements but we’re rapidly declining back to the pre-Watergate days. If you think about Watergate, the problems were that there were these undisclosed secret slush funds … there were illegal corporate contributions and cash contributions being made, there were for the most part no effective campaign contributions limits, thus facilitating influence-buying, whether it was the milk producers or people paying to become ambassadors or others. If you look today, at least in terms of candidates and party committees, we have more effective contribution limits than we had then, (and) we have better disclosure than we had then. There have been major improvements, but the hallmark reform post-Watergrate — the presidential campaigns public funding system — has withered away and died. Now we’ve seen the rise of all kinds of different entities that are involved in political activity and we have more secret money, undisclosed money, flowing into American politics today than we did during the Watergate era. Q: Why is is this so important to you? A: In a democracy you should have transparency, particularly transparency in campaign funding because it’s a way for individuals to see who supports a candidate and the types of sources of support so they can make a judgment about a candidate. Transparency is important because it’s a way of holding individuals and donors accountable for the money that they put in the system. As the Supreme Court has said for 40 years now, it helps safeguard against corruption by shedding light on the types of transaction that can be used to buy influence. And also, it’s essential to enforce the law. That’s why the problems of the disclosure and transparency to me seems to be the biggest problem. The first step is just seeing the money before you can worry about the size of the money. It’s a situation where if we don’t do something about it, more and more of this money will move into the shadows.